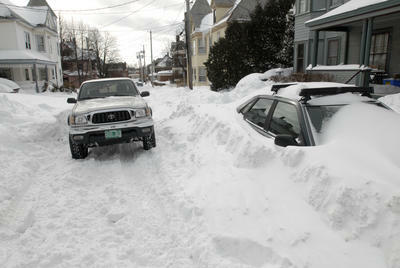 The aftermath of a Feb. 14, 2007 blizzard in Burlington, Vermont. The latest East Coast blizzard is expected to only brush Burlington with a few inches of new snow. Photo by Peter Huoppi. I’m hugely disappointed. I wanted to get nailed. I know, I know, a practical man would not wish a blizzard on himself. I have a lot of appointments for work tomorrow, places to drive, people to see. A blizzard would not make that any easier. I don’t have time to shovel two feet of wind blown snow out of my driveway, and if people cancel my meetings, I’m screwed at work. When you’re experiencing a blizzard, it’s not always fun. The last real one we had was on Valentine’s Day, 2007. We had more than two feet of heavy, wind-blown snow in about 18 hours. Driving home from work that day, I couldn’t see beyond the hood of my truck. I had to guess where the road was. Luckily, I pretty much guessed right. A lot of people didn’t. And it took me forever to dig out the next day. My back was killing me. But, looking back, it was a so much fun. Just because during a storm like that, everything changes. Cars stop. Routines do, too. The landscape changes shapes as drifts grow. The same old same old gets boring, and there’s nothing like a big storm to jazz things up a bit. So, I’m still hoping the storm now looming on the coast unexpectedly loops north and blasts St. Albans. I doubt it will. To those in blizzard-wracked New York and Boston, who are feeling the pain, I have only one thing to say. You lucky dawgs you! This entry was posted on December 26, 2010 at 7:30 pm and is filed under Uncategorized. You can follow any responses to this entry through the RSS 2.0 feed. You can leave a response, or trackback from your own site.